We started growing bamboos, getting on for twenty years ago, only vaguely aware that they were ornamental grasses. At the time, we lived in a flat above one of the busiest roads in Bangkok. It may seem the reason for choosing bamboos was to screen out the view, noise and pollution. And, yes, they did that too …. But the real reason to grow them was less practical. We’d been smitten by the mesmerising sight of them marching for mile after mile across the hillsides skirting the road to Kanchanaburi. Wanting to be in the thick of them, we found an accessible, way-marked grove above the notorious Hellfire Pass. Fittingly, for a place steeped in such human suffering, the towering culms filtered light, drawing the gaze upwards with the power of a cathedral rose window. For us, it felt hallowed place, a natural adjunct to a poignant man-made monument : the incredible Memorial Museum. It’s well worth visiting, if not in person, then via its website. 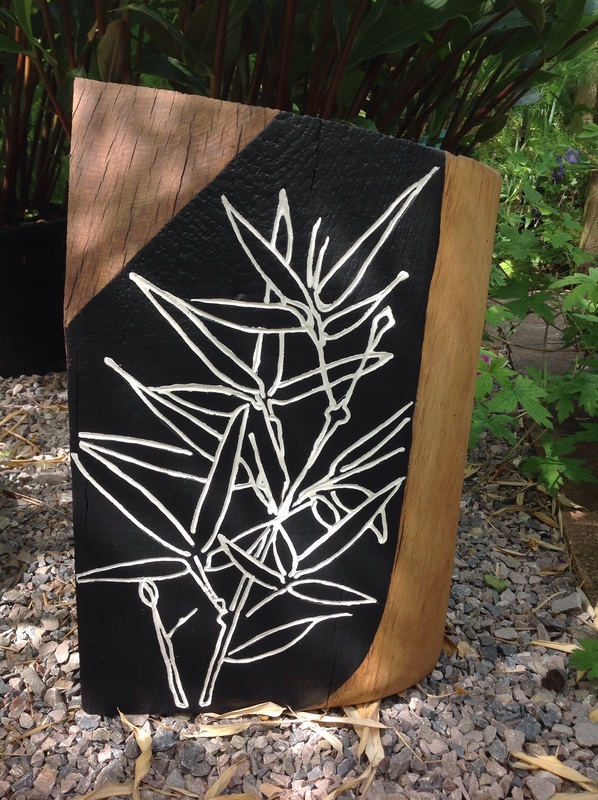 On our return to the UK, it was no coincidence that we chose the flat in East London with its roof garden featuring containerised screens of immaculately presented ebony stemmed Phyllostachys nigra. 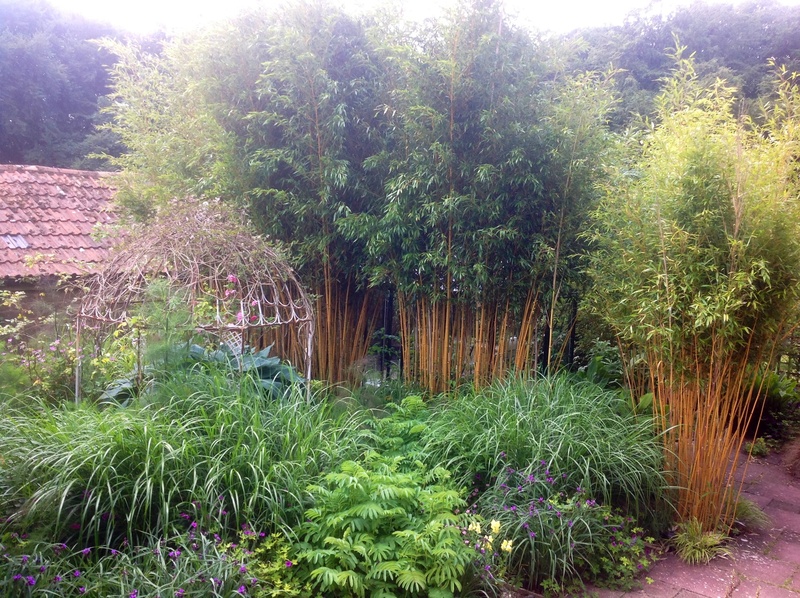 These days we grow two varieties of bamboo : Phyllostachys aureocaulis vivax, the up to 6m tall giant Chinese timber bamboo, and … … the slightly shorter ‘yellow grove bamboo’, Phyllostachys aureosulcata spectabalis, under planted with Hakonechloa macra Albostriata. Both function as architectural screens, both have glossy, yellow canes illuminating the shade with golden light. Both attract considerable interest among our garden visitors, curious to know how they’re grown. In the wilderness around Sai Yok the bamboo looked after itself, it roamed free : the garden growing of them is a different story …. Though not as aggressive as other species such as the highly invasive Sasa Veitchii, it’s still wise to consider the whys and wherefores of growing Phyllostachys in a smaller garden setting. Keeping them both looking good and under control is Hitesh’s pastime, they’re his pride and joy. This oak sculpture sits on a gravel area that was excavated this winter to root prune a less than ideally ground planted specimen …. In some ways capacious pots may seem a better alternative. In Thailand bamboos grew happily in very large salt glazed pots for many years, admittedly, surviving on an artificial daily diet, guzzling huge quantities of water mixed with a dubious looking liquid feed. We traveled a lot in those days. Every month or so, when our house keeper, Khun Dang, was left to care for the plants, she’d smile at my instructions saying “Thai plants don’t swim”. Every month or so, the neglected bamboos would shed their leaves in protest. I soon learnt that they would recover with TLC, I learnt to shrug and smile more, and to sigh less. Kept in confined quarters, in pots of whatever size, including the trench and raised sleeper beds that we use, phyllostatchys requires feeding during the growing season, February to October, to keep them looking good. We favour monthly applications of admittedly whiffy dried chicken manure, applied after rain and then watered in well, quenching their thirsty nature into the bargain. Alternatively, specialised slow release fertiliser may be applied once every six months. As far as I know, having kept them in pots in two subsequent gardens, phyllostachys grows well in outsized pots, at least for five years. I doubt that pots make a happy forever home. And, I certainly wouldn’t risk growing it in your best ceramic planter, as I once did. We grow bamboo according to its vigour. 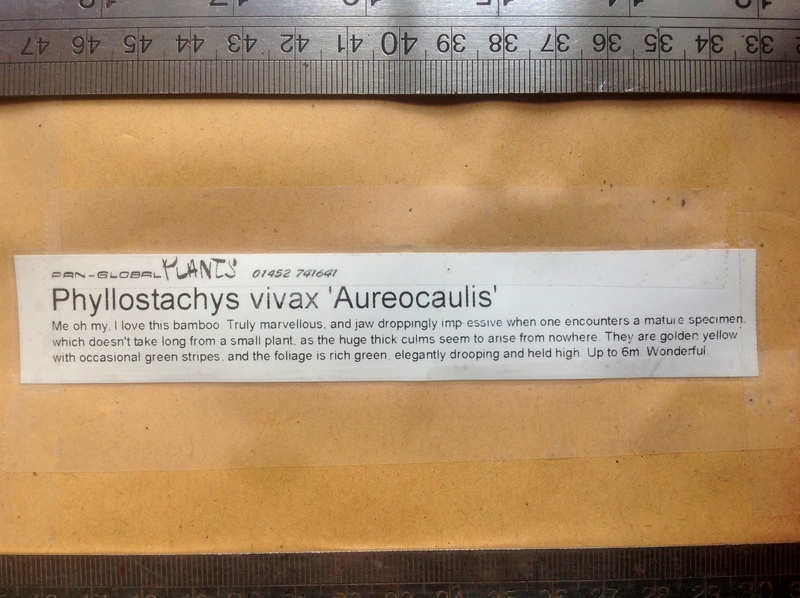 P.vivax is planted in stout sleeper beds lined with the toughest grade of root membrane. 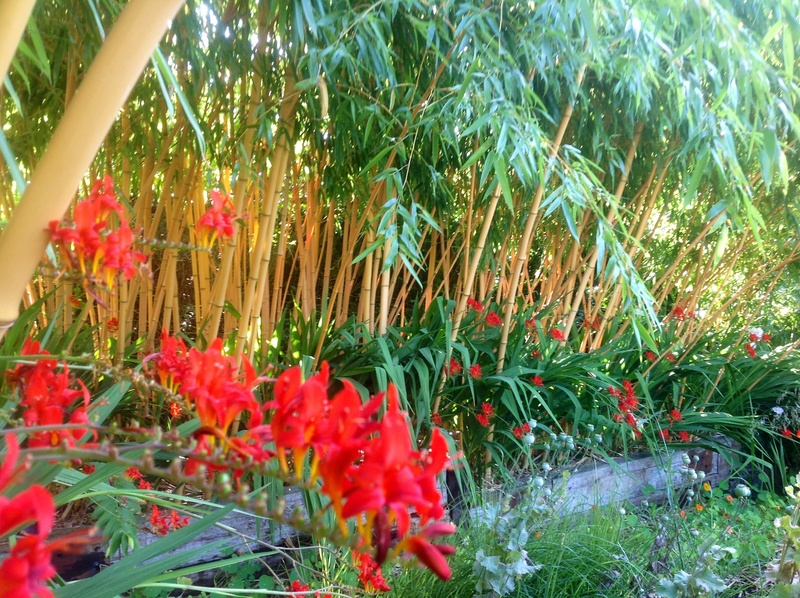 The recycled railway sleepers seem appropriate in themselves, forming part of a tableau which is especially evocative in July when the pockets of Crocosmia ‘Lucifer’ erupt in a fiery blaze. Two years ago, I came across a new blood red crocosmia named ‘Hellfire’ at Derry Watkins nursery, Special Plants near Bath. That made me gulp. Planted just several years ago, this bamboo has lived up to Nick Macer’s superlative description. A few plants purchased from his fabulous nursery, Pan Global Plants, have gone a very long way, and, I’m sure they’d like to go a lot further! In time, it’s likely the west facing sleeper edges will need to be dismantled, just imagine the fun we’ll have root pruning the congested rhizomes within the beds. The beds are raised and three tier deep, as yet, there haven’t been any below ground escapees. But it’s to be expected that the odd adventurous runner will try to creep over the top of the bed. Fresh and sappy, new runners are easy to dispatch with loppers, but ripened runners, like ripened canes require heavier duty tools. Nick grows P. vivax as a natural looking ground-grown stand, with years of experience he makes taming the dragon look effortless. The stand is spectacular, but it’s the use of a maintenance perimeter that was an object lesson for us. 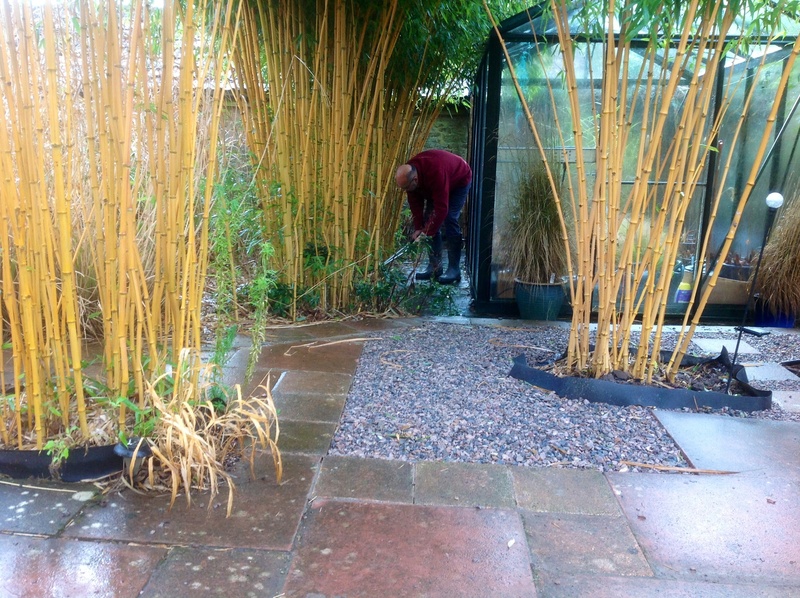 It’s well worth talking to Nick if you’re thinking about growing any type of non-clumping bamboo. The bamboo screen of P. aureosulcata spectabalis in front of the greenhouse is planted with a maintenance zone beside the trench to allow for pruning the odd runner. Although the portion of this bed between the bamboo and the klong jar looks like a permanent planting, it’s not. All of the plants here are either easy to transplant, expendable, or thuggish. An annual mid summer sortee with a sharp spade doesn’t phase Euphorbia ‘Fire Glow’ which, remarkably, has wandered into the heart of the clumps. This particular bamboo is not as well turned out as it should be, and, admittedly, the planting of it in an inaccessible spot was a mistake. I should have known better, but, in June, it makes me cheerful to see Geranium ‘Blue Cloud’ using it as a climbing frame. Stripping the stems, or not, and to what height is a matter of personal preference. In confined quarters, as specimen hedges, our bamboo has to look as smart as possible. It also helps highlight variegated features like the ‘bars code’ stripes of P.vivax. Being evergreen is an advantage in the winter months, leaving annual maintenance until then is not. Keeping the architectural stems or culms clear of side branches at a desired height cost us several sets of secateurs, before we were shown how very much easier it is to snap them off when they’re still young and sappy. It also results in a cleaner finish. Thinning the number of stems in mature clumps of phyllostachys makes a dramatic difference. Since reaching maturity, this has been done to a greater or lesser extent every February, before the new spears start to show, using regular loppers on the greenhouse stands and a pruning saw on the vivax. The result are radiant railings plus a surfeit of garden canes. Bamboos are self mulching, leaves should be left to accumulate in situ. Even in our windy garden, the silica rich leaves collect largely around the base of the plants, then decompose very slowly releasing the vital mineral. Silica is what lends the canes strength, as well as creating glassy smooth leaves that rustle so evocatively in the breeze. As evergreens, bamboos still have a period of early summer leaf renewal, so there’s a month or two of light litter rather than a sudden autumnal whoosh. In an area where they’re grown above bark paths this helps keep the paths weed free. Chasing leaves about in the confined patio in front of the greenhouse is a bit of a niggle, but I, chief chaser, think it’s worth it. I’m not sure if it’s worth collecting the papery culm sheaths shed as the new canes telescopically expand to their full height. I don’t doubt that they make excellent firefighters, but for me, if I’ve time to spare, then I prefer to just sit back and watch these remarkable giant grasses grow at the staggering rate of a foot a day between mid June and mid July. But by then, perhaps, I’d rather be watching the tennis, instead. I don’t sigh about the fact that our garden isn’t large enough to let the bamboos run wild, we don’t have half a hillside to spare. 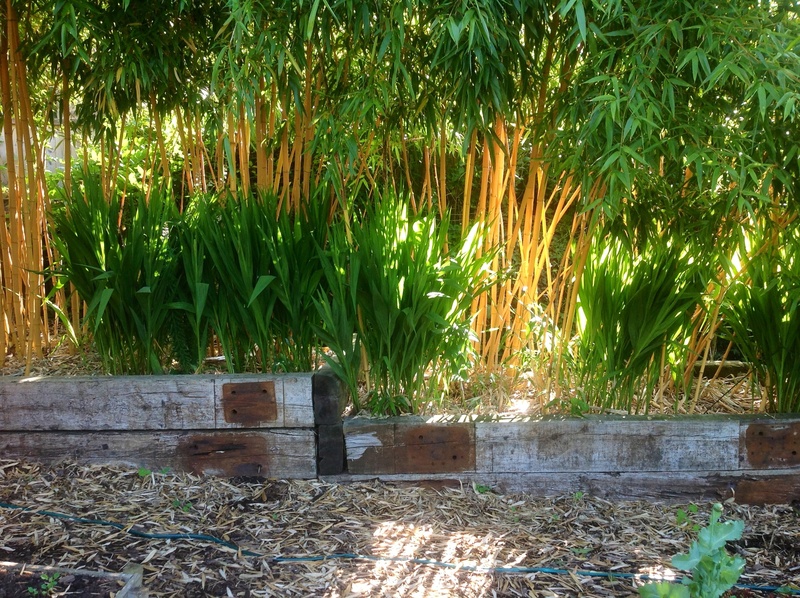 Our objective is to maintain phyllostachys as decorative ‘raised’ hedges that make us smile. And, inevitably, bamboos will always remind us of a special place far off the beaten track in South East Asia. 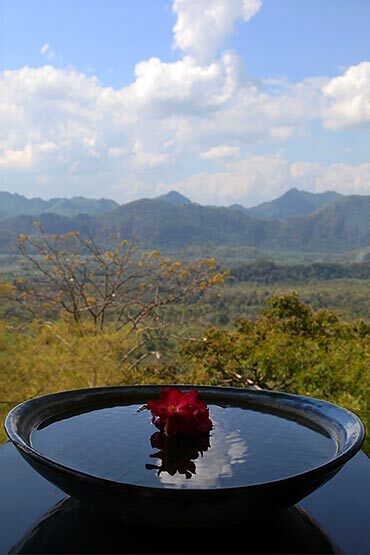 Photos of Hellfire Pass and Peace Vessel courtesy of Hellfire Pass Memorial Mueum , Sai Yok, Kanchanaburi, Thailand. A really fascinating post and stunning photos. I love how plants can evoke memories and connect us with places that we hold dear. I absolutely agree, aren’t plants and flowers amazing? 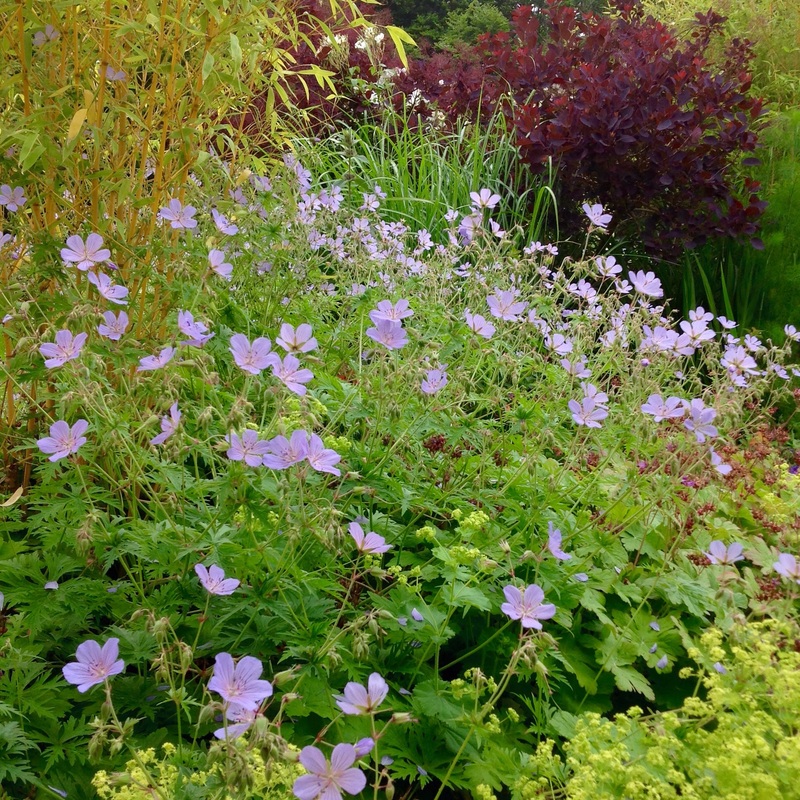 I love gardens that are like a magic carpet ride …. I’ve been trying to work out where I’ve seen your garden before and it was, of course, on Wellywoman’s blog. I love the way you’ve used grasses, something I’m wanting to do in an informal way on my steep slope. 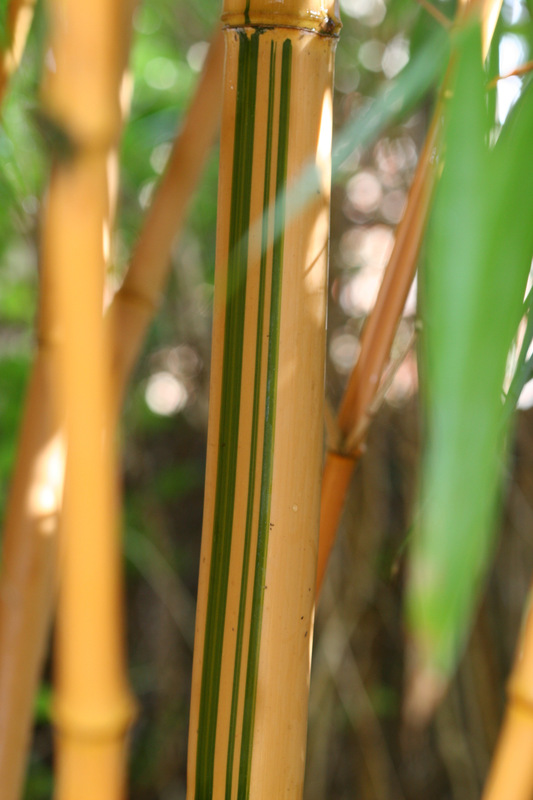 I’ve grown bamboos before too, P. nigra and the stripy yellow and green stemmed one and boy, do they spread. They’ve even lifted paving stones. But I do love them, especially with the stems stripped as you have done. Could they take a bit of shade? Hi, Rusty Duck, thanks for visiting the website. Your garden looks wonderful, there are lots of gorgeous grasses good for weaving into informal schemes. 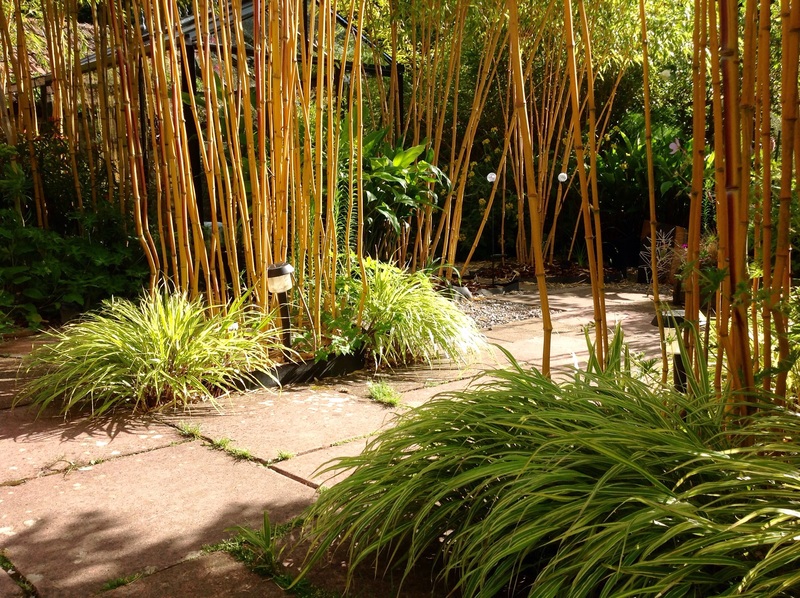 You’re right, phyllostachys can be a bit of an enthusiastic plant, yet worth cultivating for its beautiful canes. Shade’s fine … which variety are you considering? I still love P. nigra. And there’s a variety with blue culms whose name escapes me..
Love P. Nigra, too. Apparently, there’s a dwarf cultivar ‘Othello’ but not found/tried it. 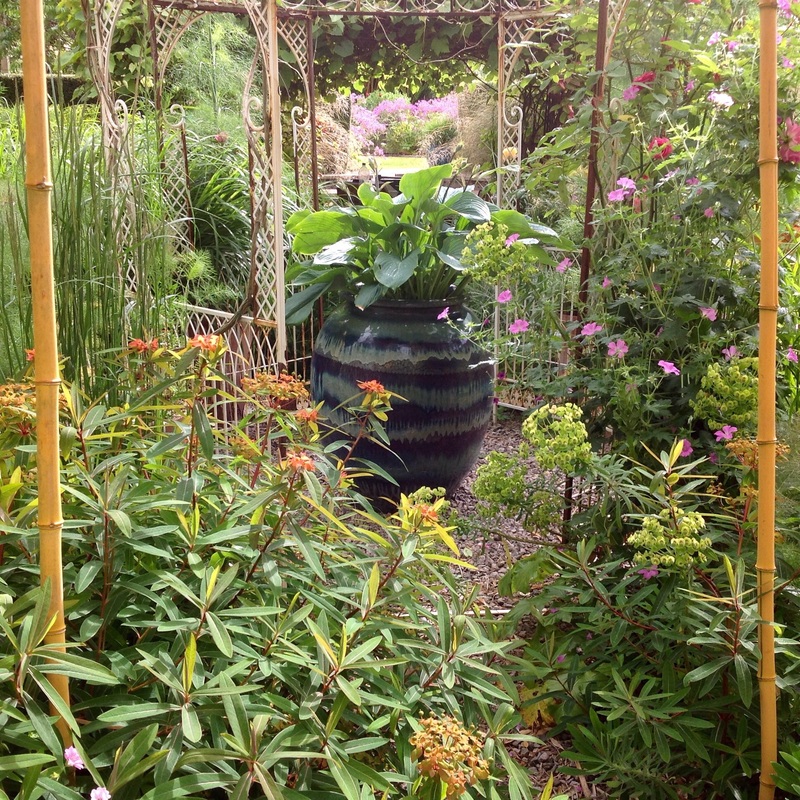 Haven’t heard of the blue stemmed phyllostachys, sounds wonderful, will ask my dear friend and all things grassy expert, Roger Grounds, when I see him this weekend! By the way, tried (& failed) to leave a comment on your latest post, there’s a Piet Ouldolf garden at Hauser and Wirth, Bruton, Somerset. Luckily not so far from either of us. Hi again, Jessica, after a bit of rummaging around the only grey-blue stemmed is Phyllostachys nigra f. Henonsis. RHS site doesn’t make it sound wonderful, but at least 3 others suggest it ages to a beautiful ethereal grey-blue, maybe try http://www.gardeningexpress.co.uk for sourcing it. Sounds wonderful, thanks for bringing it to my attention. Fargesia is a very good choice for that very reason. Some of the phyllostachys are more vigorous than others, again, the black one is an excellent choice. Your friends garden sounds fascinating … maybe they have discovered the secret? I was recently told by an expert that it takes up to seven years for the more vigourous ones to make a run for it, interesting eh? I too hope we’ll get to talk in person, one day Annette! Oh, pure heaven! Thank you🙂.